Is your prayer life feeling uninspired and stale? Still learning how to pray? Want to develop your prayer language and connect more deeply with God? Ready to enrich and reignite your prayer life and further enhance your relationship with God? Want to explore creative prayer methods and fresh ideas for prayer? That’s exactly where I was when I embarked on a journey of learning to pray. I knew some basics of prayer and, through praying raw, from-the-heart prayers, I’d come face-to-face with the most loving God I could have imagined. I wanted to know more, to deepen my experience of prayer, and uncover more ways to pray. So, I set out to explore as many prayer methods as I could find. When I first discovered the power of prayer in my life, it came after praying the same prayer in the same way for months. I continued this prayer for even longer, after God answered, because I didn’t know any other way to pray. Yet, over time, I began to lose my focus and consistency. My prayers became devoid of passion and I was no longer as tuned into God’s voice as before. I needed a change. In trying new ways to pray, I was able to shake up my prayers and breathe new life into my relationship with God. I discovered new facets of the conversation and new ways to listen for his voice. Variety in my prayers has been essential to keep me focused and consistent, continuing to grow and develop in my relationship with God. You communicate with your friends in a variety of ways – email, phone calls, text messages, Facebook posts, face-to-face conversations, serving side-by-side, and sharing experiences. Some conversations don’t even require words. You talk about all kinds of topics and share different facets of your life. So, shouldn’t your communication with God also take different forms and functions? We can’t always have the same conversation in our prayers. We need to be well-rounded and broaden the ways we communicate. Would you marry someone with whom you’d only conversed with over text messaging? Probably not. While that might be a great way to get to know someone, it’s probably not going to let you fully form the relationship. Some topics don’t lend them to that communication method. You need to also communicate through other methods to truly build a deep, lasting relationship. The same is true with God. You need to communicate through different methods and cover a variety of topics to build a relationship with deep roots and lasting impact for your life. But first, what is prayer and why is prayer important? Before you dive into the different prayer methods, take some time to get clear on what prayer means for you. What questions and doubts do you have about prayer? I’ve collected a list below of some of the questions I’ve had about prayer. If any of these (all of these) resonate with your heart, I hope you’ll click through and get grounded in these foundations. I may not have all the answers (and maybe they’ll spark more questions for you), but let’s journey through these together. Why isn’t God answering my prayers? How long do I keep praying? How can prayer be more effective? More than just a “Hail Mary pass” when I’m desperate? How can I incorporate daily prayer into my life? In my journey to explore prayer, I researched and practiced these 23 methods for learning to pray. I found authentic connection to God through each, although some resonated more with me than others. I encourage you to explore these prayer ideas yourself and find the ways to pray that fit best with your unique personality and gifts. God made you uniquely, so you’ll find your own ways to best connect with God. Download a copy of the Free Prayer Cards here. Simply enter your email address and I’ll send a set of free printable prayer cards, explaining each of these prayer methods. I keep a set on my desk and use them in my prayer time to guide my prayers and provide ideas when I need a bit of variety. If you want to explore these in a more structured manner, I encourage you to get Pray Deep: 21 Days to Ignite Your Prayer Life. This 21-day daily devotional will guide you through a different prayer method each day, providing the instructions and prompts to deepen your prayers and develop your prayer language. If you’re new to prayer or want to deepen your experience in the fundamentals before diving deeper, start with these templates for prayer. The Lord’s Prayer is the prayer Jesus used to teach his disciples how to pray and it’s the perfect place for us to start, too. In fact, if you really want to learn how to pray and how the Lord’s Prayer can teach you, go get the Pray Deep: The Lord’s Prayer 40 day prayer journal and learn to pray the Lord’s Prayer line-by-line and truly uncover the power in those 72 words. The A.C.T.S. Prayer follows a similar format of topics as the Lord’s Prayer, but uses an easy-to-remember acronym. This is a great one to help you remember some key topics to cover in your prayers. The 5 Finger Prayer is another template of prayer topics as you pray for others. Both are also great methods to teach your children. If you’re not sure the words to pray or want to expand your own prayer language by using words that have been prayed by millions of people for hundreds of years, then praying the collects from The Book of Common Prayer can be a meaningful addition to your prayer time. These words are not only poetic and grounded in scripture, but can help you express the yearnings of your heart for which you can’t find the right words. Praying through Every Day Prompts is a method I love for creating consistency and is fantastic to use with your family, too. Prayer Journaling will deepen and enrich your prayer time by helping you process your prayers and record what you hear from God. When you’re ready to take the next step to deepen your prayers and develop your prayer language, dive into praying the scriptures. Praying the Psalms is the most ancient prayer book and how people have learned to pray since the days of King David. You’ll learn to express the deepest yearnings of your heart, explore every human emotion, and truly praise God in every situation. You can also Pray Scriptures other than the Psalms and respond to God’s Word through prayer. The more you pray through scripture, the more God’s Word will become embedded into the fabric of your heart and be the words you call upon in times of need. Listening is just as important, especially as we read and pray through scripture. Lectio Divina is an ancient form of prayer, called “divine reading”. It’s a powerful way to pray and listen for God’s voice through the scriptures. Gospel Contemplation is also an ancient contemplative form of prayer, but more focused on listening to God through passages in the Gospel. Music is a powerful expression of the heart, and can be used for prayer, too. Praying a Song can utilize traditional hymns, as well as contemporary worship songs. The Taize-style Prayer incorporates music into a time of scripture and prayer, using music to enhance and deepen the prayers. Whether you’re an artist or you can’t draw more than a basic stick figure (like me! ), praying with art can be a freeing way to express yourself in prayer. Even with my limited artistic skills, I’ve found praying through art to be deeply moving and one of my favorite methods to reignite my prayer time. Praying through Prayer Doodles and Prayer Circles (mandalas) are both ways to express your prayers through art and release your mind to speak to God on a deeper level. These tactile, creative forms of prayer can help you bring renewed focus to your prayer time. Visio Divina (“divine seeing”) and Praying with Icons are ways to pray through works of art. While more passive forms of prayer, I found these both to be surprisingly powerful for me. Walking the Labyrinth is an ancient form of prayer. While some may find this one controversial as it’s been used in numerous religious, it has deep Christian roots and, when used appropriately, can help you bring deep focus to your prayers and help you meet God through this pilgrimage through the labyrinth. Taking a Prayer Walk is a great way to pray for others in your community. Take a physical walk through your neighborhood or through a part of town that desperately needs prayer, or take a virtual prayer walk from within your own house. Sometimes the most meaningful conversations don’t include any spoken words. Sometimes we simply need to be quiet and listen. Listening Prayer and Centering Prayer are two forms of prayer to help you pray through silence, focusing more on listening for God’s response. The Examen is a way to debrief with God, reviewing your day or week with God and listening for his guidance on where you did well and how you can do better next time. Prayer shouldn’t only be focused on ourselves. In fact, Jesus encouraged us to gather together in prayer, promising he’d be in our midst wherever two or more are gathered in his name. Praying with a Prayer Partner brings accountability to your prayers and allows another to intercede on your behalf. You’ll also learn to pray for someone else, praying aloud with others. Praying with the Saints is less interactive, but a way to call upon others to intercede on your behalf. How Will You Grow Your Prayer Life? We all have room to grow and learn. Building a vibrant and authentic prayer life requires training and practice, along with dedication to build consistent habits. Will you take the next step to grow yours? Explore the questions and doubts you have about prayer and ask God to clarify his answers for you. Dive into these prayer methods and learn how to pray. Find new prayer methods to enrich and broaden your prayer experience. Grow your prayer language by praying through the words of others and the words of scripture. Reignite your prayer life by trying a new prayer method! If you want to find other resources to help you build more consistency in your prayer life through daily devotionals to guide you through various forms and methods of prayer, check out the Pray Deep Store. Digging into some different ways to approach prayer has invigorated my prayer life and I’m really excited to share! Beautiful! LOVE the prayer cards as a guide to refocus prayer time. I’ve been using the prayer cards for the past couple of months and they’ve been great for keeping me focused – and also encouraging different ways to pray so I don’t get stuck in a prayer rut. Glad you like the idea! Please do check back all through Lent! New prayer topics each day. I’m so excited it’s finally here and I can share all these great ways to ramp up prayer time. Those sections are some of my favorite, too! Actually, I’ve come to like most of them – even the art ones, even though I’m totally not artistic. Glad you’re going to join this prayer journey! This is great Kathryn. Seriously. Thank you for providing tangible ways we can pray better. I love it when faith gets practical. And, thank you for joining the #RaRalinkup with Purposeful Faith. Thanks, Kelly! I’m super-excited about this series. Just doing the research and practicing these different forms of prayer over the past couple of months has made such an impact on my own prayer life. I can’t wait to see what God does over these next weeks! I can’t get through life without praying. It may not be like 2 hours long, it could just be a quick yet heartfelt sentence, but I got to pray. Or I’ll get weak. Thanks for sharing tips on praying deeply. We really do need to exercise our prayer life to make it strong. Praying deep isn’t always about praying for a long time, but about really connecting with God in your prayers. It is such an essential part of our Christian lives! This is awesome. Thank you. You are an inspiration. Thanks, Robert! The study and prep for this series have made a big impact for me and I’m excited to finally get to share! 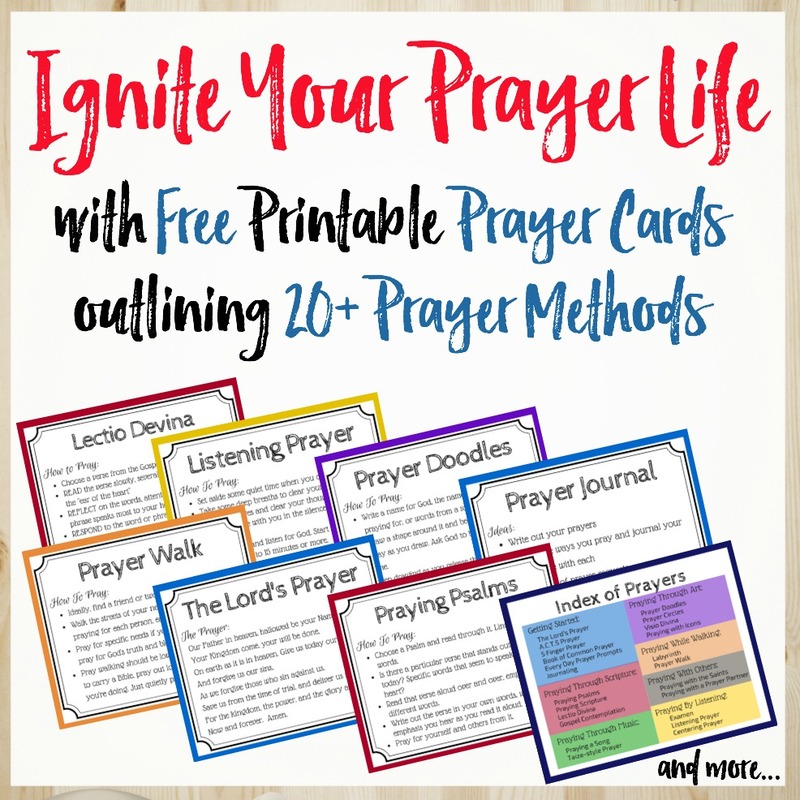 Great ways to ignite our prayer life! thank you for sharing them with us! Thanks, Marie! These different prayer methods have rocked my prayer life in some amazing ways and I’m excited to finally start sharing! “We’re each created unique, with different learning styles and preferred senses, so why wouldn’t God want to connect with us in the way He’s wired us?” I have believed this for some time – that our unique personalities cause us each to have different ways to pray. Looking forward to this series! I think this is SO true! I was planning a women’s conference with two other women and we were trying out some of these prayer methods. We found that we each had different favorites, ones perfectly suited to our gifting. I didn’t connect as well with the art methods, but was deeply moved by some of the scripture-based techniques. Another woman, who is very creative and artistic, found the art ones to be her favorites. Hope you can find your favorites – and even try some that may be a little outside your comfort zone. This is really great Kathryn. I look forward to reading more in this series. Thanks for linking up with Grace and Truth. Kathryn, so glad I came over to get your Pray Deep printable prayer cards…they are truly inspiring and anointed…I printed mine on cardstock and will start using them today…thank you for stopping by my post on “The Lamb of God” and leaving a comment this morning…I just connected-the-dots to you. Many blessings! Beth – I’m so touched today by your comments and that these posts are speaking to you. This has been such a labor of love – and I’ve absolutely loved digging into so many forms of prayer. I hope you’ll like the prayer cards. I’ve been using my set in the mornings, trying out different prayer forms each day to keep motivated and connecting in different ways. It’s a great reminder of other ways to pray so I don’t get stuck in a rut. Hi Kathryn! I love your prayer cards idea! Would I be able to purchase a pre-made laminated set from you through etsy or paypal? Thanks! Are the prayer cards in the books on heavy card stock paper? Are they perforated? Thanks! Sorry – the prayer cards are just printed in the book, but not on heavier paper or perforated. Unfortunately I don’t have any read-made options for the prayer cards as such. Wish I could help more, but all I can offer are the free printable, but you’d have to print and cut out yourself.